The old-school lunch box is getting PackIt's cool twist! The Classic Freezable Lunch Box is the only horizontal lunch box with built-in cooling that chills food and drinks for hours. 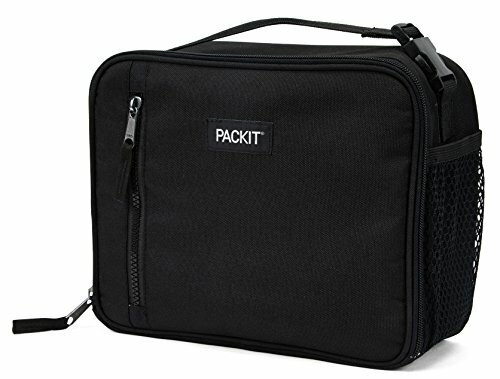 The secret is PackIt's groundbreaking technology: a freezable gel liner is integrated into the walls of the lunch box. The design eliminates the need for separate ice packs or gel packs. To use, simply flatten the lunch box and place it in the freezer overnight (12 hours for optimal results). In the morning, the walls of the lunch box will be completely frozen and ready to chill items for hours. PackIt lunch bags and lunch boxes keep food cooler longer, which allows you to pack healthy foods that would spoil in other lunch boxes such as dairy, deli meats, salads, fruits and veggies. The Classic Freezable Lunch Box by PackIt easily fits an entire meal and a 12 ounce (340ml) drink. A top-load design makes this lunch box simple to pack, and its kid-friendly zipper closure locks in cold, dry air. This innovative lunch box also features a mesh side pocket for a small water bottle or snacks, and a slim exterior zip pocket for ID cards or wipes. A buckle handle lets you clip the lunchbox onto totes, backpacks or sports bags. PackIt’s Classic Lunchbox is made from nontoxic poly canvas and has a food-safe, water-resistant lining. Like all PackIt products, the Classic Lunchbox is made from PVC-, BPA-, phthalate-, formaldehyde- and lead-free materials. Care: wipe thoroughly or hand wash the interior and spot clean exterior; allow bag to dry completely before freezing. Not machine or dishwasher safe. PackIt’s Classic Freezable Lunch Box measures 8.25 inches tall, 10 inches wide and 4.25 inches deep while open. When collapsed, it measures 10 inches wide, 8.5 inches deep and 2.25 inches tall for easy storage in the freezer.